According to the National Highway Traffic Safety Administration (NHTSA), motorcyclists are much more likely to be involved in a crash than operators of passenger cars. More than 55,000 people are injured and more than 2,200 people are killed each year due to motorcycle accidents. As Boca Raton motorcycle accident lawyers, we help people who have been injured in these catastrophic crashes. We also assist families who have lost loved ones in motorcycle accidents. If you have been injured in a motorcycle collision, or you are mourning the loss of a loved one due to a motorcycle accident, you have important rights. Protect your rights by speaking to a Florida motorcycle accident lawyer as soon as possible. Most people know that motorcycles are inherently more dangerous than cars. Without an outer structure to protect the body from the impact of a crash, motorcyclists are far more vulnerable than drivers of cars and trucks. In 2014, there were a total of 92,000 motorcyclists injured and over 4,500 deaths. Motorcyclists are 27 times more likely to be killed in a crash compared to other motorists, and almost five times more likely to be injured than passenger car drivers. Almost 40 percent of those killed in motorcycle accidents were not wearing a helmet at the time of the accident. More than 50 out of every 100,000 registered motorcyclists were involved in a fatal crash, compared to only nine out of 100,000 registered passenger car drivers. The NHTSA estimates that helmets helped save over 1,600 lives in motorcycle crashes in 2013 and could have saved over 700 more lives had the victims been wearing helmets. States without universal helmet laws accounted for almost 60 percent of all motorcyclists killed, compared to only eight percent in states with universal helmet laws. Almost 30 percent of motorcyclists involved in fatal crashes in 2014 had blood alcohol concentration levels of 0.8 percent or higher, compared to only 22 percent of passenger car drivers involved in fatal crashes. Also Read: Do You Know the Common Motorcycle Accident Facts? Beautiful weather comes at a price, especially for motorcyclists in Florida. When it comes to motorcycle accident deaths, Florida leads the entire nation, with motorcyclists accounting for almost 20 percent of motor vehicle fatalities. According to a recent survey conducted by AAA Consumer Pulse, even though the economic costs of each motorcycle fatality is over $1.4 million, nearly 20 percent of motorcyclists do not have insurance. These economic costs include property damage, medical costs, legal and court fees, emergency service costs, insurance administration costs, work losses, and loss of productivity. The survey also asked members of the public if motorcyclists should be required to wear helmets while riding. Although 15 percent of those surveyed said no, it’s refreshing to know that 85 percent answered yes. Among motorcyclists, however, these numbers are lower, with 32 percent of Florida motorcyclists saying they do not support mandatory helmet laws. Florida leads the nation in motorcycle related accidents, and these numbers show no indication of decreasing. 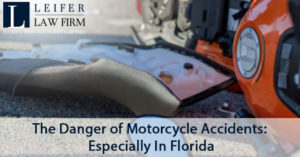 If you or a loved one has been injured in a motorcycle collision, call a Boca Raton motorcycle accident attorney today. The experienced personal injury attorneys at The Leifer Law Firm can help you get the personal attention and compensation you deserve.